The arrival of the cuckoo is the signal that spring has come. It arrives some time in mid April. The cuckoo sings from St. Tiburtius' Day (14 April) to St John's Day (24 June). However in Worcestershire there is a saying that the cuckoo is never heard before Tenbury fair (21 April), or after Pershore fair (26 June). The difference in dates is because traditionally the bird arrives in different parts of the UK during April. Various dates in April are called 'Cuckoo Day ' and some places hold 'Cuckoo Fairs'. Marsden Cuckoo Day in West Yorkshire is an annual traditional festival that celebrates the arrival of spring. According to a local legend, Marsdeners used to try to prolong the cuckoo's stay by building a wall around its nest. 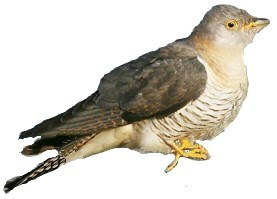 Heathfield Cuckoo Fair in East Sussex is an annual tradition of releasing a cuckoo to mark the beginning of summer. A tale of Heathfield Fair depicts an Old Woman releasing the Cuckoo from her basket, whereupon he "flies up England carrying warmer days with him". Downton Cuckoo Fair is an annual traditional event held on the greens of the picturesque village of Downton, south of Salisbury, Wiltshire. The fair marks the "opening the gate" to let the cuckoo through. 14 April 1865: A few minutes after 10 o'clock in the evening, a shot rang out in a crowded play house in Washington, USA. John Wilkes Booth, an actor, had shot Abraham Lincoln. He died at 7.22 a.m. on 15 April. Abraham Lincoln was one of the greatest of all US presidents. During his time as as the 16th President, slavery was abolished for ever in America.